Twice in the past week we've seen malware for jailbroken iPhones - a relatively innocuous one that "Rickrolls" the iPhone and changes its wallpaper, and a much more serious one that can access and copy anything from a jailbroken iPhone. In both cases, all you need do to protect yourself is change the default password to something else. This does highlight the risks involved with jailbreaking. "It appears that at least four variants of the worm have been written so far, and they don't do anything other than install the Rick Astley wallpaper. Since all four variants are available in the wild, however, there is the possibility that someone could add a more malicious payload to the code." "These hacks work only on jailbroken iPhones, so unmodified iPhones won't be affected. Users that do jailbreak their iPhones should change the default SSH password to avoid the worm, too. "Since many iPhone owners don't understand the potential security risks involved with jailbreaking, however, there will likely be a large base of phones for hackers to target. 'My prediction is that we may see more attacks like this in the future,' Mr. Cluley said." PR: Intego has released their important November 11, 2009 Security Memo. Following the recent discovery of a worm that changes wallpaper on iPhones, Intego has spotted another piece of malware that attacks iPhones, one that is far more dangerous than the ikee worm. This hacker tool, which Intego identifies as iPhone/Privacy.A, takes advantage of the same vulnerability in the iPhone as the ikee worm, allowing hackers to connect to any jailbroken iPhone (iPhones hacked to allow installation of software other than through iTunes) whose owners have not changed the root password. When connecting to a jailbroken iPhone, this tool allows a hacker to silently copy a treasure trove of user data from a compromised iPhone: email, contacts, SMSs, calendars, photos, music files, videos, as well as any data recorded by any iPhone app. Unlike the ikee worm, which signals its presence by changing the iPhone's wallpaper, this hacker tool gives no indication that it has invaded an iPhone. Hackers using this tool will install it on a computer - Mac, PC, Unix, or Linux - then let it work. It scans the network accessible to it, and when it finds a jailbroken iPhone, breaks into it, then steals data and records it. This hacker tool could easily be installed, for example, on a computer on display in a retail store, which could then scan all iPhones that pass within the reach of its network. Or, a hacker could sit in an Internet cafe and let his computer scan all iPhones that come within the range of the WiFi network in search of data. Hackers could even install this tool on their own iPhones, and use it to scan for jailbroken phones as they go about their daily business. Means of protection: Intego VirusBarrier X5 detects and eradicates this program on Macs and identifies it as iPhone/Privacy.A. While it is not possible to protect the iPhone from this hacker tool - it does not install anything on an iPhone - VirusBarrier X5 can ensure that Macs, especially in businesses, are protected from this hacker tool being installed. We would like to stress that users who jailbreak their iPhones are exposing themselves to known vulnerabilities that are being exploited by code that is circulating in the wild. While the number of iPhones attacked may be minimal, the amount of personal data that can be compromised strongly suggests that iPhone users should stick with their stock configuration and not jailbreak their devices. "...here's my 10-round preliminary take on how the new Verizon smart phone fares against the iPhone 3G S, which remains - at least for now - the highest-rated smart phone in our Ratings (available to subscribers)." iPhone wins 5 rounds, Droid 3, and they tie on 2. "There is no piece of technological wizardry that I want so much as a Droid. Yet, I have decided to hold onto my iPhone. Why? Because the iPhone is the PC of smartphones. "...Yes, Google's Android operating system may someday - probably will - become the standard for comparison among smartphones. "That time, however, is not here and may not arrive for several years. In the meantime, if I want just one smartphone, it will be an iPhone. The iPhone today represents compatibility and standards . . . the opposite of the situation that Apple finds itself in with computers." PR: As part of its ongoing mobility strategy, Radio Shack has announced announce that it will introduce Apple's iPhone 3G and iPhone 3GS in a limited number of company-owned stores in the Dallas-Fort Worth and New York City metropolitan areas beginning later this month. Radio Shack expects to introduce iPhone in stores nationwide in 2010. "As one of the most publicized gadgets in recent history, it's no surprise that Apple's iPhone has won over the hearts & minds of many a smart-phone owner. But who are the iPhone users really? What makes them tick? In a recent Gadgetology study Retrevo set out to learn the answer to these and other questions. The result; a snapshot profile of a typical iPhone owner. "The findings are considerably less than flattering." PR: TapFactory has released Stick It 2.1 for iPhone and iPod touch. Using your iPhone or iPod while driving can be dangerous (and in some places illegal), but for those times when we must, an app like "Stick It" can help keep it to a minimum, so you can keep your eyes on the road. "Stick It" is a utility that allows you to quickly and easily take notes, customize their look, and create beautiful wallpapers for your lockscreen to function as quick reminders (a feature many have lamented should have been built into the device OS itself). "In addition to lockscreen reminders being an iPhone/iPod touch feature sorely missed by many users," says TapFactory, developers of "Stick It", "we've developed Stick It to provide users with a way to view notes and reminders without having to unlock their device. This results in safer driving, higher productivity, and another fun way to increase the iPhone/iPod touch's usefulness in their daily lives." TapFactory continues, "Imagine it's 5:30 p.m. after a long day at the office. You're cruising down the freeway on your way home, in a daze from the whirlwind of paperwork you left behind. You glance at your phone to see the time - only a quick glance because you don't want to veer off the road - and with a single push to the home button you see your reminder that your significant other asked you to pick up some steak on the way home, otherwise you're eating oatmeal for dinner. Now if you had typed this into your Notes app or a "to-do" app, would you have ever remembered? Probably not. And if you had, the concentration it took to unlock your phone, navigate to the proper app, and open it to view your reminders while driving could easily result in an accident. Thanks to Stick It, you had loaded your custom designed reminder notes to your lockscreen wallpaper, instead of them being tucked away inside an app." Released in June 2009, "Stick It" has maintained its position in the Top 100 Paid Utility Apps since. TapFactory says they are constantly encouraging feedback and listening to their user's feature requests. "Stick It" Version 3.0, which will include a host of new features and user interface improvements, is currently in development and is slated to be submitted to Apple in mid December 2009. "We're constantly pushing the iPhone/iPod touch platform to add functionality that makes the device more fun and useful in people's daily lives," says TapFactory, "and if we've achieved that with a little $.99 app then we are fulfilled." Stick It 2.1 is 99¢ and available worldwide exclusively through the App Store in the Utilities category. PR: PressReader from NewspaperDirect lets millions of iPhone and iPod touch users download and read more than 1,400 full-content digital replicas of their favorite newspapers and magazines. NewspaperDirect Inc., the world leader in multichannel newspaper and magazine content distribution and monetization, has launched an iPhone version of its popular PressReader application. 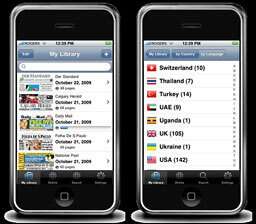 Using the iPhone PressReader application, millions of iPhone and iPod touch users can now download their favorite daily read from a selection of more than 1,400 newspapers and magazines available on PressDisplay.com, the world's biggest online newspaper kiosk. PressReader is the easiest way to view offline the hundreds of publications available on PressDisplay.com, in a convenient, portable format. PressReader presents publications as full-content digital replicas in their original layout. Every article, advertisement, crossword puzzle and cartoon is presented in its original context in the paper, with the ability to instantly zoom in on any element. PressReader offers rich-graphics or text-only viewing options, an interactive table of contents, cross-title searching, sharing of articles, and live, clickable elements such as URLs, telephone numbers, email addresses and hyperlinks to other articles. The PressReader iPhone application and (during November) the first seven titles are free downloads from the iTunes App Store. Then, for the price of a local newspaper on the street, users can download any of the growing list of prestigious international and national titles PressReader has to offer, wherever they are, including: The Washington Post, New York Post, Globe and Mail, National Post, The Guardian, Daily Mail, International Herald Tribune, The Australian, Gazeta Wyborcza, Corriere della Sera, Bangkok Post, and Kommersant, to name just a few. "Other news applications for the iPhone offer limited website access or a reduced version of the publisher's content, whereas PressReader delivers your favorite publication in its entirety and original layout; it's just like reading the paper," said Alex Kroogman, CEO of NewspaperDirect. "We're continually enhancing PressReader for iPhone, and we're looking forward to offering the application on new devices Apple might announce such as the highly anticipated Apple tablet." PressReader has been completely optimized for iPhone and iPod touch, enabling users to flip through pages just as they would browse a real newspaper, and then zoom in to view any article or photograph in stunning clarity. PressDisplay.com is popular with consumers who want access to multiple news sources, and corporate customers who need to monitor printed media for business-critical news. With more than 1,400 full-content digital replicas of newspapers and magazines from 88 countries in 42 languages, it has also become the standard in over 2,500 libraries around the world. PressDisplay.com and PressReader have also been optimized for Windows PCs, Macs, and other handheld e-reading devices. NewspaperDirect delivers the world's newspapers and magazines to millions of readers the way they want to receive them - in print, online, or on their mobile device or e-reader - wherever they live, travel, work or play. With the most innovative digital publishing technology in the industry and the only no-operational-cost business model, NewspaperDirect is recognized as the world leader in multichannel content distribution and monetization, and is the chosen partner of over almost 1,400 publishers from 90 countries. Optimized for PCs, Macs, Smartphones, iPhone, iPod touch, BlackBerry and various popular e-readers, NewspaperDirect's flagship products (PressDisplay.com and PressReader) go beyond the traditional RSS or text-based formats of other digital editions and deliver full-content publications that are compliant with international audit bureau requirements. PressDisplay.com also enhances the reading experience with powerful features such as cross-title search, monitoring, article ranking, bookmarks, instant translation, on-demand audio and social features that allow readers to comment on content and the quality of reporting, share articles, and interact with other readers. SmartEdition, powered by PressDisplay technology, offers publishers a fully customizable digital edition platform with powerful and proprietary back office reporting and analysis tools (Reading Map, Ad Value Map) that help them optimally manage their content and advertisers. NewspaperDirect provides full hosting, payment acceptance, customer service management and technical support. PR: M.O.C. Interior Designer, LLC releases Mark On Call 2.0 for the iPhone and iPod touch, a major update to the incredibly popular interior design app, that makes sharing even easier! Now room designs can be published and stored on the Web where owners of the application can peruse the new "Rooms Gallery", an aggregated area of all users' published rooms. From directly inside the app, users can download, customize and apply the room designs of others to their own personal space. The gallery lets users backup rooms, move rooms to another floor plan, create room templates, and collaborate with other designers, clients, friends, family, or Mark On Call users. Additionally, users of the application may discover fabrics or finishes on someone else's furnishings in a published room, import that room, and automatically collect and apply these newfound custom color presets. A custom color preset is created when a user takes a picture of an actual finish, fabric, rug, paint color, wallpaper pattern, or flooring material and "skins" the image onto an item or surface in their room using the iPhone's camera or an image from their photo library. The "Rooms Gallery" features a Cover Flow interface and can filter results by "Just My Rooms" or by room type. Published rooms can be deleted only by the original creator. The Rooms Gallery will soon be publicly viewable from the Mark On Call website. The new Room Editor, where rooms can be accurately drawn and measured to scale, offers nine room shape templates, customizable with a "touch and drag" system. Not only can walls be moved, but now corners can be added (or deleted) and repositioned to create precise angles. To assist with architectural accuracy, walls turn green at 0, 30, 45, 60 and 90 degrees and display the degree number next to the wall measurement. A customizable background option that can be used to represent wall paint or a wallpaper pattern has also been added to version 2.0, and functions the same as rendering a room item or floor surface. Users may coordinate rugs, flooring and other room items to their walls in this virtual space before actualizing their design plans. Based on Mark Lewison's home decorating book, "What Would You Do With This Room? My 10 Foolproof Commandments to Great Interior Design", Mark On Call is truly home design in the "palm of your hand". Users can access and customize 156 furniture and architectural elements, choose from a palette of preset color, fabric and finish options, take advantage of the easy-to-use color wheel, add snapshots of floor models corresponding to items in their room designs, create and share detailed shopping lists, and send images of their room creations via in app email. It's an excellent tool for interior designers to help them conceptualize, design, store and shop for clients, or anyone planning their fantasy or actual living space. The application works in both the Metric and Imperial measurement systems. Mark On Call 2.0 is priced at $4.99 and is available exclusively from Apple's App Store. Mark On Call 2.0 works on the iPhone and iPod touch. Minimum system requirement: iPhone OS 3.0. Mark On Call 2.0 Rooms Gallery feature requires a network connection. PR: Logos Bible Software has released a free iPhone app designed to help people get more into Bible study than ever before. Unlike most Bible related iPhone apps, which are merely Bible readers, the Logos Bible Software iPhone app delivers tools and resources to help you study the Bible with your iPhone or iPod touch in ways never before implemented on a mobile device. "When we set out to develop our iPhone app, we wanted to replicate the functionality of our desktop software," said Bob Pritchett, President of Logos Bible Software. "Not only did we do it, but we are now able to reach our greater goal of getting more people into the study of God's Word by giving this app away for free." If you have the newest version of Logos Bible Software's desktop application, Logos 4, then you will also have access to many of the books from your Logos base package. Currently more than 2,000 titles can be viewed on the Logos Bible Software iPhone app and more will be added regularly until more than 10,000 titles are available on the iPhone. The Logos Bible Software iPhone app is designed to help you do more than just read the Bible. Dig deeper into the Scripture with the Passage Guide. Enter a verse and click "go" to receive a report linking directly to commentaries referencing your verse. The Passage Guide also provides a cross reference list, media resources, topics, and interesting words. All linked to resources in your library. A second way to get deeper into Bible study is through a Bible Word Study. Tap and hold any word in a Bible with a reverse interlinear and a popup will display the English word along with all the original language information. From this popup, click Bible Word Study to see the definition, pronunciation, translations, and example uses of the various translations. Finally, complete your Bible study by comparing verse across various translations with the Text Comparison tool. Open a verse in Text Comparison and see exactly where each translation differs. No other Bible app for the iPhone provides the depth of tools for Bible study that the free Logos Bible Software app provides. 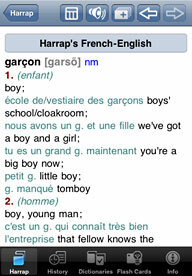 Paragon Software Group, the leading software developer of electronic dictionaries for desktop PCs and smartphones, has just released the 'talking' Harrap's English-French & French-English Dictionary for iPhone and iPod touch devices (also, available for Android, BlackBerry, Java, Windows Mobile, Symbian OS). The dictionary is based on the original Harrap's Shorter French Dictionary, the most popular dictionary in the French-speaking world. Harrap's comprehensive and up-to-date words and translations accompanied by real English and French voice pronunciations, grammar tips, multiple usage samples, learning tools, and free online content updates provide a new model for dictionaries developed for mobile devices. In the era of texting, tweeting and blogging, we are all professional writers extensively using English language skills. Harrap's English-French & French-English Dictionary covers more than 375,000 words and phrases, including contemporary vocabulary from areas such as technology, business and science, and even regional usage and spelling from a variety of English-speaking areas. Useful information on English culture and traditions is also included, making Harrap's English-French Dictionary the most essential source for communication in English. Search History shows the last 100 translated words. Compatibility: iPhone OS 2.0-3.0. The same dictionary is also available for desktop PCs and other mobile smartphones. 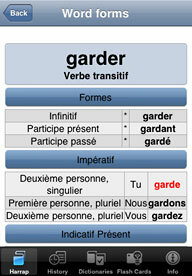 Harrap's English-French & French-English Dictionary for iPhone/iPod touch is available for $24.99 (19,99 EUR) via download from the AppStore. PR: Macsoftex announces iAlcohol 1.1, an update to their blood alcohol content app for iPhone and iPod touch. Intuitively easy to use, iAlcohol determines the level of alcohol in a person's blood and calculates the required break in driving. The formula calculates the influence of factors on the duration of the phases of alcohol intoxication, providing 90% accuracy. The application will help you choose a suitable drink and the amount you are allowed to consume within this interval of time. iAlcohol - iPhone App which determines the level of alcohol in a person's blood and calculates the required break in driving. iAlcohol is a unique development, whose developers excelled at using the previous experience of work with similar programs. For the first time they managed to accumulate and evaluate the majority of all the conclusive parameters, which had not been taken into account when calculating the speed of alcohol elimination from a blood. The calculation formula for the application takes into account the maximum number of factors that affect the result, thus providing 90% accuracy. The formula calculates the influence of factors on the duration of the phases of alcohol intoxication: phase Absorption and phase Elimination of alcohol. The app is intuitively easy to use. You may plan to drink alcohol and know the exact time when you plan to start driving. The application will help you choose a suitable drink and the amount you are allowed to consume within this interval of time. It is also possible to calculate alcohol concentration in situations when different types of drinks are consumed simultaneously. A timer will inform you about the time when you can start driving. It will still count time if you exit the app. The application allows registering several user profiles, remembering each user's name, weight, gender and history of measurements for each user separately. iAlcohol 1.1 is $1.99 and available worldwide exclusively through the App Store in the Entertainment category. PR: Readdle has announced the release of Scanner Pro 1.1, new version of their popular iPhone application that transforms the device into portable scanner. Scanner Pro 1.1 introduces highly anticipated Evernote integration that lets people convert printed documents, receipts and even handwritten notes into searchable information accessible from anywhere. Scanner Pro 1.1 is available on Apple App Store at $6.99 to the new customers and as a free upgrade for existing users. 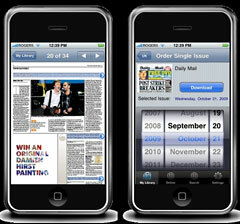 The application is compatible with iPhones running iPhone OS 2.2.1 and later. PR: Apple's gotten the world hooked on portable music, pictures, and videos. One thing they haven't delivered, though, is an easy guide for getting the most from your sleek little entertainment center. That's where this book comes in. J.D. Biersdorfer and David Pogue come to the rescue with the latest edition of their chock-full-of-tips, full-color guide: the world's most popular iPod book. iPod: The Missing Manual (O'Reilly, $19.99), now in its 8th edition, provides a no-nonsense view of the latest iPod line, including the tiny Shuffle, the video-capable Nano, the high-capacity Classic, and the WiFi-enabled Touch. With crystal-clear explanations and easy-to-follow color graphics, the book provides expert guidance on all of the amazing things you can do. "The latest line of iPods, especially the Touch and the Nano, have many new features and this book introduces new owners to each one so they don't miss out on any of the fun. There's also a new version of iTunes and the iTunes Store, and this book explains all the cool new stuff you can do with your iTunes library as well as how to find your way around the newly overhauled iTunes Store," says Biersdorfer. Fill 'er up. Load your Nano, Classic, Touch, or Shuffle with music, movies, and photos, and learn how to play it all back. Share music and movies. Copy music between computers with Home Sharing, beam playlists around the house, and whisk your Nano's videos to YouTube. iTunes, tuned up. Pick-and-choose which music, movies, and photos to sync; create instant playlists with Genius Mix; and auto-rename "Untitled" tracks. iPod Power. Create Genius playlists on your iPod, shoot movies on your Nano, tap the Nano's FM radio and pedometer, and add voice memos to your Touch. Tour the new iTunes store. Find what you're looking for in a snap, and get lyrics, liner notes, and more with iTunes LP. Even if you don't have one of the brand new iPods, this Missing Manual has plenty of information on iTunes 9, the App Store, and everything else you'll want to know. 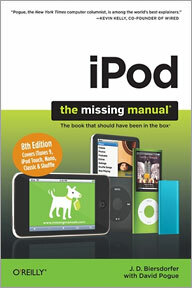 iPod: The Missing Manual is as useful, satisfying, and reliable as its subject. David Pogue, Yale '85, is the weekly personal-technology columnist for the New York Times and an Emmy award-winning tech correspondent for CBS News. His funny tech videos appear weekly on CNBC. And with 3 million books in print, he is also one of the world's best-selling how- to authors. In 1999, he launched his own series of amusing, practical, and user-friendly computer books called Missing Manuals, which now includes 100 titles. Purchase link: Available from Amazon.com for $13.49. Free shipping on orders over $25. 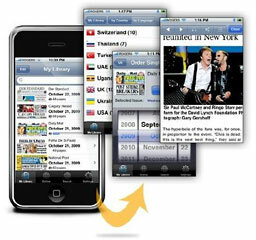 PR: Watch media directly from your iPhone/iPod. handheld pico projector - only 4.5" x 3" x 2.5"
PR: Upgrade your iPhone listening experience with this inline control with HD Radio from Gigaware. 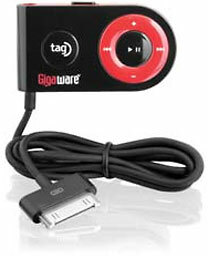 Simply attach it to the dock connector on your iPhone (also fits iPod touch) and start enjoying HD radio. Featuring more choices, crystal-clear sound and no subscription fees, it lets you enjoy your music the way it was meant to be heard. Song information, such as title and artist, appears on your iPod's display and iTunes Tagging allows you to "tag" songs you hear on the radio for subsequent purchase via Apple's iTunes. Plus, the inline remote replicates the click wheel of the iPod, giving you a handy extra set of controls. PR: This is an accessory with 2 sticky blades and one stand (angle adjustable) that allows you to "stick" your mobile phone, iPhone, iPod, GPS, MP3 . . . in a user-friendly place, e.g. in front of your work desk or on your the flat place above your operating panel of your car. The stick blades allow you stick your gadget it in a quick and easy way or get it from, while the adjustable stand allows you to adjust to an angle that is most friendly to you. Holds your gadget in a place that is most friendly to you. You may have your gadget in any flat surface in any angle the is most friendly to you. PR: Kensington Computer Products Group has announced today, a wide variety of products to make holiday gift giving easy and affordable. Kensington's sleek and stylish must-have devices for accessorizing smartphones and netbooks will make ideal gifts for the holiday season and won't leave you sulking over an empty wallet. The recent October 2009 Consumer Electronics Holiday Purchase Patterns Study* projects that 93% of U.S. adults (an estimated 215 million people) will be purchasing gifts during the upcoming holiday season. Interestingly, though the research indicates that a third of these holiday shoppers are planning to spend less on holiday gifts compared to 2008, the average dollar amount allocated for consumer electronic gift purchases is a respectable $222 - an amount that has actually increased by 8% from last year. "We understand the importance of making smart consumer electronic purchases this holiday season, and Kensington is helping its customers meet that need," says Christine Dumery, Director, Marketing Communications, Kensington. "Demand for products that help enhance usage of mobile devices continues to grow considerably. Our accessories make thoughtful gifts that will keep families connected with the personal technology they depend on in their everyday lifestyle, while still being affordable for their holiday budget." Leave the clutter behind, Kensington offers a compact charger made just for USB-powered devices so that smartphones and other mobile equipment are ready to work at all times. Stuffing stockings this holiday season is now easy and affordable for the mobile moguls on your holiday list. Charge your Blackberryor any other USB-powered device without cluttering up your car. The Kensington USB Car Charger has all the power you need in an ultra low profile design that fits right into your vehicle's interior and especially your holiday stocking. More popular than ever, netbooks remain a high priority on every gadget geek's holiday wish list and Kensington's collection of netbook accessories make ideal complements to these miniature wonders. Don't let the small size and small price fool you, these products go a long way to making a bigger and better experience with any netbook. 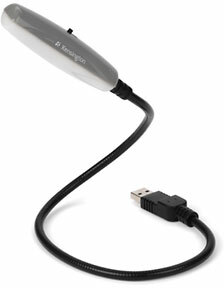 Brighten up your video chats this holiday season with the Kensington Video Chat Light for Netbooks. It plugs into any USB port and easily adjusts to help you look your best whether you're at the office or relaxing on the sofa. Here is an all-in-one gift collection of simple, reliable accessories made just for your netbook. From a wired mobile mouse that make surfing a joy to a Neoprene sleeve and a self-coiling lock that will protect your netbook when on the go. Each Kensington netbook accessory is sized to suit your netbook and fit easily in your travel bag. So visiting the school library or your local coffee shop is as easy as visiting your favorite website. Any iPhone or iPod owner can tell you, their device goes where they go all year round, so keeping connected is a must. 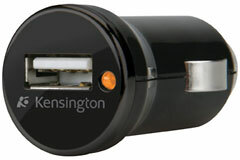 Kensington's variety of accessories for iPhone and iPod put the pleasure back into giving and receiving. These smart made simple devices provide the power, entertainment, and navigation needed for your iPhone and iPod in any environment. Give your iPhone GPS, podcasts, and phone calls a sound boost this holiday season. The built-in amplification system in the cradle doubles the volume coming from your iPhone speaker, making it easier to hear your turn-by-turn directions, calls and more. The cradle mounts in seconds to the windshield or vent and holds your iPhone securely on even the roughest terrain. Perfect for those long flights home for the holidays is a big boost of power with zero charging cables to pack in your travel bag. Everything you need to charge and power your device is built in to the Kensington Travel Battery Pack and Charger for iPhone and iPod touch. It even doubles as a kickstand for hands-free landscape viewing of movies and videos when you're on the road. All-in-one design; no cables needed. Here is a gift that gives back all year round. It is all the power you need and is never far away. 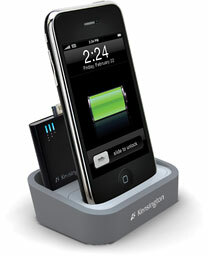 The compact dock recharges your iPhone (including new iPhone 3GS) or iPod so you can leave home with it fully charged. The dock also charges the included Mini Battery Pack so you can take an extra boost of backup power with you on the go. 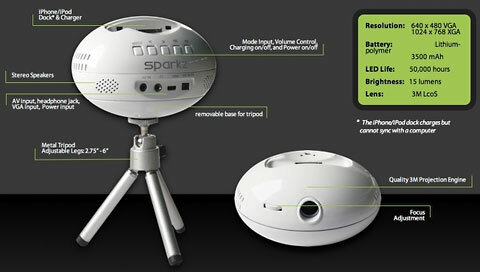 All Kensington products are currently available at Amazon.com, Kensington.com, and other major retailers. PR: Want to turn your iPhone to superb stuff? Now you have one more kit. This telescope has a superb 8x expansion that can help you to close up any objects from afar 8 times. It is a telescope with manual focus, just turning the ring in the front of the scope to the clearest shot. 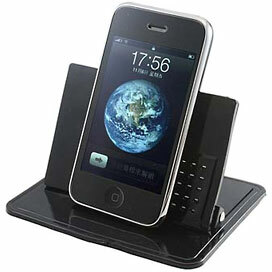 It comes with a stand that you may have your iPhone 3G/iPhone 3GS clipping on the stand to take pictures and movies.